Rookie phenom Tomas Hertl got off to a torrid start before suffering a potentially season-ending knee injury, and since then, the Sharks have slipped back into the pack in the Pacific. The San Jose Sharks got off to another torrid start this season (10-1-1), only to slip a bit in December (5-5-1), leading to the predictable notion that this was just another Sharks tease. But the numbers say otherwise. The Sharks lead the league in shots on goal (36.5) and shot differential (8.3), they’re fourth in goals per game (3.14), they can roll four effective lines when healthy, they have a playoff-proven goaltender and they are very much in the hunt for the Pacific Division title and the Western Conference’s No. 1 seed as they visit for a game against the Phoenix Coyotes on Friday night at Jobing.com Arena in Glendale. We caught up with San Jose Mercury News beat writer David Pollak to get his thoughts on some of the bigger storylines surrounding the Sharks this season. You can follow him on Twitter at @PollakOnSharks. 1. What is the thinking regarding the team’s key impending unrestricted free agents (forwards Joe Thornton, Patrick Marleau and defenseman Dan Boyle)? Can San Jose really bring all three back, and if not, who gets priority? Pollak: At the start of the season, (general manager Doug) Wilson indicated he wanted to be able to bring all three back next season, and all three indicated they wanted to be back. The question is, can the Sharks squeeze all three under the salary cap — and when it was announced it’s likely to be around $71 million next season that became a little more do-able. Thornton already has made it clear through his brother/agent that he’s content to come back for three years at the same $7 million cap hit; no figures have been tossed around for Marleau and Boyle, but it’s pretty safe to say they would not be getting any more than Thornton. Wilson won’t have a lot left to spend elsewhere, but with a $71 million cap, it appears he could get all three signed if he feels the same way at the end of the season that he did at the beginning. Who gets priority? Just a guess, but this is still Joe Thornton’s team despite what we may have written in the past about the next generation taking over. 2. Some have expressed concern with goalie Antti Niemi’s recent play. Is there any concern internally? If so, does his track record mitigate that? And on that note, has he been the NHL’s most underrated (or underpaid) goalie? Pollak: (Coach) Todd McLellan chooses his words carefully, but yes, there is at least a little concern internally about Niemi’s play as of late. Big picture, I think they’re still confident. Short term, there’s probably been one goal each game in December that he would have saved in October and November. And that’s contributed to the Sharks’ struggles this month. More recent goaltender contracts than his have dropped Niemi into the middle of the pack. You could argue he’s underpaid. You could also argue that a lot of the others are overpaid. 3. 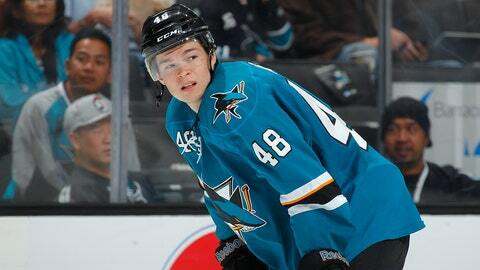 How might rookie forward Tomas Hertl’s injury impact this team? And how have others impacted the club (such as forwards Raffi Torres, Adam Burish)? Pollak: I thought the loss of Torres would have had a bigger impact because he was such a difference-maker after he arrived from Phoenix at the trade deadline and into the playoffs. He was huge here. But the arrival of Hertl seemed to have offset that, and the Sharks didn’t seem to miss a beat in October. Without Hertl — and it hasn’t been ruled out that he’ll miss the entire season — I think we’ll all start to notice the absence of Torres more, though he is likely to be back right before or right after the Olympic break. Burish’s presence was most strongly felt in the playoffs. Sure, the Sharks could use him now and his return will upgrade the fourth line, but he’s more of a role player and not a key element. 4. The popular national storyline for the Sharks is that this is a make-or-break season. Is that the view on the inside as well, and if so, who might be impacted if they don’t meet goals? Pollak: No, the Sharks don’t see it that way. And don’t ask Dan Boyle any questions about windows closing or you might get an earful. Boyle — and the GM — say that windows don’t close on good teams, that players like Joe Pavelski and Logan Couture and Marc-Edouard Vlasic keep that window open. For now, owner Hasso Plattner has expressed nothing but confidence in Wilson’s handling of the hockey side, and Wilson was quick to announce a contract extension for Todd McLellan after last season. Still, no franchise is immune from change if expectations are not met. The expectations in San Jose are to field a strong team that enters each season as a playoff contender with a legit shot at the Cup. By that definition, those expectations have been met, even if the big prize continues to elude the Sharks. 5. The numbers say the Sharks are for real. Are you convinced? Why or why not? Pollak: In October, like a lot of Octobers before this one, the Sharks looked like world-beaters. In December, not so much. Bottom line with the Sharks is that, when healthy, they can be a very scary team. Add Raffi Torres to the lineup that they fielded the first month of the season and they look as for-real as any team. But when injuries force Todd McLellan to turn to Plan B as far as certain line combinations, San Jose looks a lot more vulnerable.